My dad had a friend when I was younger who had a private pilot's license. One day, when I was just 2 years old, my dad took me with him on a airplane ride with this friend. I remember getting into the plane. I remember that the plane was a small light weight plane with only 4 seats. We took off from Salt Lake City's smaller airport. I can't tell you what the take off was like. I just remember being way up in the air. This is where my memory kicks into high gear. 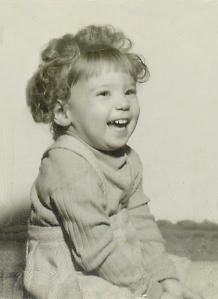 The fact that we were way up in the air settled quite profoundly on my 2-year old self. I remember being completely aware of the ramifications of our position in the clouds. When an airplane turns it does not simply turn like a car. It tilts. So when our plane tilted so that MY window was pointing down this 2-year old got a "little" uneasy. It was at this point that my little self said, "DON'T TURN THE PLANE UPSIDE DOWN!!!!" i remember my first train ride at the age of four. you sure were a cutie, kell! here's a little o.t. hope for u.s. all! Nanc, I saw that article from the link on Republicus. YA!! If only! btw...that picture was taken about the time of that plane ride. I was 2 1/2. So, what do you remember about your train ride? My Grandfather had a pilot's license before I was born, My earliest memories are of flying. When I was old enough to reach the pedals and see over the dashboard, I remember that he would let me take over the plane and fly in straight (?) lines here and there. We sure had fun in those planes! I still get a little nervous being up in the air. Since that time I can count on my two hands the number of times I have been in a plane. My second plane trip was in 1986 at the ripe old age of 20. It was on a trip to NY to visit my sister who was a nanny. It was the very next year when I found myself on a plane once again. This time I was again crossing the country to serve as a missionary in VA.
A year and a half later I got to fly home. In 1991 I got to fly from Denver to Salt Lake when we decided to move back from Colorado to live in Utah again. Then it was 2005 before I was on a plane again. That time I flew to, of all places, Des Moines, IA. It was a spur of the moment meet-the-hubby-for-the-weekend-during-his-business trip. Now my hubby has been on so many plane trips that he has acrued a lot of frequent flyer miles. Now we are trying to figure out how we will use those miles. Yes, this means getting on another plane. btw...James, what great memories you must have with that grandpa. Kelly, as you might know, my dad was a pilot when I was 2 years old! We flew everywhere since both my parents were teachers and had every summer off. I HATED flying, and always got air sick. If I have a choice, I usually take driving over flying even now. I like to leave the flying to the experts....the birds. How cute! Kids have the most amazing way of looking at things. LOL! I've flown so many times I can't remember the first one. Although it was probably from Phoenix to Salt Lake! I still am terrified to fly with as many times as we've taken that trip. I REALLY don't like it when the plane tips sidewise! LOL! Btw - that picture looks a little familiar - is it the same one on Grandmas wall? Amy, I will have to look on the wall at her house. I am not sure if this is the one she has or not. Next time I am over there I will take a look. Brooke, speaking of kids perspectives...My grandma, on my dad's side, used to tell me about a train ride she was on when she was little. She remembers walking down the isle between the seats and everyone looking at her. Her own mother was amazed that she had that memory. You see, she was not even a year old yet. My dad's mom used to tell that story to us over and over in her later years as she suffered with Alzheimers. She loved to tells stories of her youth. Those stories are now precious memories for me. She passed on about a year and a half ago. Starla, I did not know that your dad was a pilot at one time. How cool was that!! we were going to an appointment in san francisco for my brother's heart defect. the depot we left out of was eventually turned into a restaurant that some good friends of ours own. it seemed as though everything was passing by so quickly and it made me tired - i don't remember much of it.